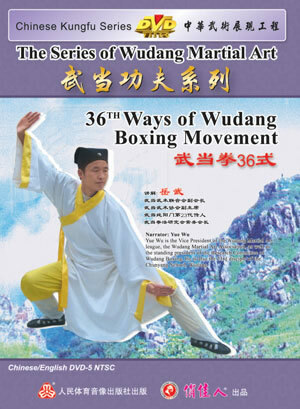 36-form Wudang Quan is also called Wudang Routine 1 of Eight-step Interlinking Palm and is the classical masterpiece created at the late age of the over 100 years old grandmaster Liu Li-hang and his disciple Chen Zong-yan. It features with the combination of fast and slow movements, complementary hardness with softness, moving as a dragon, sitting as a tiger, dodging as lightning, and attacking as thunder. It also possesses the practical combat effects of soft overcoming the hard, still overriding dynamic, and winning by late striking after your opponent has initiated the attack. With distinct Taoist features and fast movements, this routine is very suitable for young and middle age martial artists for competition or performance.